Abu Dhabi airline Etihad Airways will operate the Airbus A380 on its daily service to Seoul from July 1, 2019, it announced on Monday. Flight EY876 will depart Abu Dhabi at 11.05pm and arrive in Seoul at 11.35am the next day. The return flight EY873 will depart from the South Korean capital at 1am and arrive in the UAE capital at 5.45am. Etihad’s 486-seat A380 will provide customers on the route with new inflight experiences such as its flagship luxury area – The Residence – a private, three-room suite featuring a living room with a 32-inch LCD monitor, bedroom with a double bed, separate en-suite shower room, a dedicated personal butler and a private chef, as well as nine private first apartments that feature a flat-screen television, a chilled mini-bar, personal vanity unit, wardrobe and a shower room. The double-decker aircraft also features 70 business studios and 405 economy seats. This includes 80 economy space seats with a seat pitch of up to 36 inches. Seoul’s Incheon airport now joins London Heathrow, Paris Charles de Gaulle, New York JFK and Sydney as destinations served by Etihad’s A380 jets. The UAE and South Korea are major trade partners and the UAE is the largest importer of South Korean goods in the Middle East and Africa and the value of trade between the two countries is valued at approximately $15bn annually. 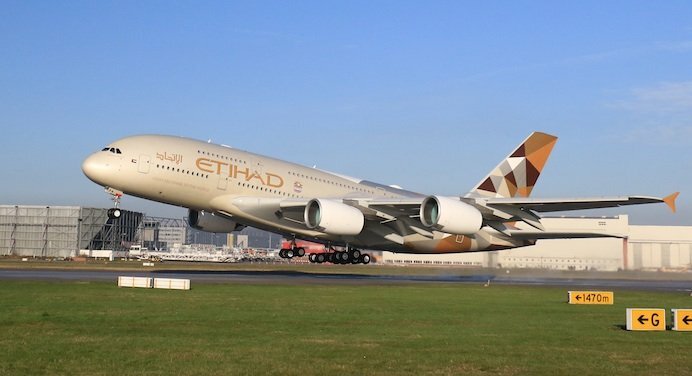 Etihad took delivery of its 10th and final Airbus A380 in May 2017. The carrier currently operates an all-A380 service to London Heathrow, New York and Paris.